The Conference Hall creates an impressive atmosphere. It is equipped with simultaneous interpretation system for six languages. It has a capacity of 700, and can be used for international conferences, as well as other meetings and congresses. The Mid-sized Hall is suitable for middle to large conferences with approx. 200 - 600 attendees. As a reception hall, the hall can accommodate approx. 270 guests for dinner style, and 400 guests for cocktail style. The hall can also be partitioned into 2 small halls. The theater-style Small Hall can also be used for conferences of up to 193 participants. It also has a simultaneous interpretation system. The room can accommodate up to 100 people in a classroom style. Room 107 and 108 can either be used separately or as one room together. With a high arched ceiling, the Meeting Room is ideal for buffet-style parties as well as for conferences.The meeting room can accommodate conferences of 180-320 participants with theater-style seating and 100-200 participants with classroom-style seating. These meeting rooms can be used for smaller meetings of 12-80 participants. Some of the rooms can be partitioned, and others can be connected to use as one. 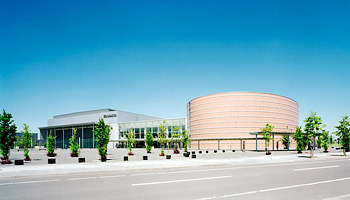 Sapporo Convention Center is located approximately 10 min. by taxi from Sapporo city center. Also, Sapporo's highly developed public transportation system provides easy assess to all the visitors. Install Adobe Reader (free) to view PDF files. From Sapporo Subway Station, take Nanboku Line to Odori Station. Change to the subway Tozai Line, and get off at Higashi-Sapporo Station. Exit from Exit 1, and head to your right. Turn right at the second traffic light (look for the Hokkaido Energetic car park), and head straight along the road. You will find the Convention Cen ter in front of you within an 8-min. walk. From Shin-Sapporo Subway Station, take Tozai Line, and get off at Higashi-Sapporo Station. Exit from Exit 2, and head to your left. Cross the street at the second traffic light (look for the large Nippon Express billboard), and head straight along the road. You will find the Convention Center in front of you within an 8-min. walk. About 60 minutes from New Chitose Airport via Sapporo Station. From New Chitose Airport, take JR line to Sapporo Station. Get off at JR Sapporo Station, and change to Nanboku Line at Sapporo Subway Station. Get off at Odori Subway Station, and change to Tozai Line. Get off at Higashi-Sapporo Station. From New Chitose Airport, take JR to Shin-Sapporo Station. Get off at JR Shin-Sapporo Station, and change to Tozai Line at Shin-Sapporo Subway Station. Get off at Higashi-Sapporo Station. Get off Hokkaido Expressway at Sapporo-minami Interchange, and continue on Nango Dori toward Sapporo. Bypass Kanjo Dori, head straight, and you will see the Daiei Higashi-Sapporo Store on your right. Pass the Daiei Higashi-Sapporo Store, and turn right at the second traffic light (look for the Nippon Express billboard on your left). Head straight, and turn left at the second traffic lights. You will find the Sapporo Convention Center on your right. Head straight along National Route 36 toward Sapporo. Turn right at “Misono 4-7” intersection into Kanjo Dori (look for Toyota and Half Dime). Head straight along Kanjo Dori, and turn left at “Higashi-Sapporo 3-jo 6-chome” intersection (look for the Shiroishi Subway Station and Royal Host). Head straight along Nango Dori, and you will see the Daiei Higashi-Sapporo Store on your right. Pass the Daiei Higashi-Sapporo Store, and turn right at the second traffic light (look for the Nippon Express billboard on your left). Head straight, and turn left at the second traffic light. You will find the Sapporo Convention Center on your right. At the Sapporo Junction of the Sasson Expressway, change to the Hokkaido Expressway bound for Tomakomai (you will drive straight onto it). Get off the expressway at Oyachi Interchange. Turn right onto Heiwa Dori and head toward downtown Sapporo. Turn left at “Heiwa Dori 7-chome Kita” traffic light. Turn right at the second traffic light “Shiroishi Hondori 8 Kita,” and head straight along Route 12 toward downtown Sapporo. Drive straight for about 4km, and turn left at “Chuo 1-1” traffic lights (look for Subaru Automotive). Head straight along the road, and you will find the Sapporo Convention Center on your right. Head east along Kita 1-jo Dori (National Route 12), and turn right at “Kita 1-jo Higashi 13-chome” intersection. Cross over the Azumahashi Bridge, head straight, and you will see a sign for the Sapporo Convention Center. Pass the sign, and turn right at the second traffic light. Head straight, and you will see Nishimatsuya on your left. Turn left at this intersection, and head straight. After about 100m, you will find the Sapporo Convention Center on your left. Get off the Hokkaido Expressway at Sapporo Junction. Head straight along Minami 7-jo Yonesato Dori toward downtown Sapporo. Turn left at “Kikusui Kamimachi 1-jo 3-chome” traffic light (look for the Kamishiroishi Elementary School). Head straight, and you will see a sign for the Sapporo Convention Center. Pass the sign, and turn right at the second traffic light. Head straight, and you will see Nishimatsuya on your left. Turn left at this intersection, and head straight. After about 100m, you will find the Sapporo Convention Center on your left. Head straight along National Route 12 toward Sapporo. Pass over Kanjo Dori, drive straight ahead, and turn left at “Chuo 1-1” traffic light (look for Subaru Automotive). Head straight along the road, you will find the Sapporo Convention Center on your right. * Please contact each airline for further details, such as number of flights and arrival/departure times. Copyright © 2010 CONVENTION LINKAGE, INC. All Rights Reserved.